History is amazing, and yet incredible stories and achievements can become so quickly forgotten. 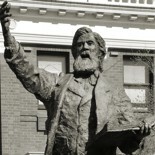 Our aim at Parkes Library is to continue to bring the amazing history of the Parkes Shire to light. A reminder of amazing events, people and facts or perhaps shedding light for new readers. This post also highlights some of the amazing resources that can be found in Parkes Library’s Family & Local History resource room. While those interested in the Chinese zodiac proclaim that 2017 is the year of the rooster, for Peak Hill it was 1970. 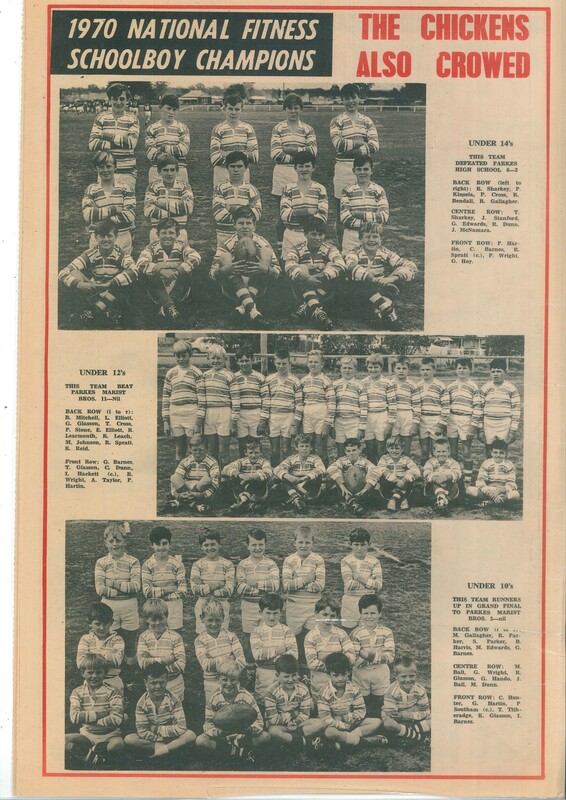 The Peak Hill Roosters, the rugby league team for Peak Hill, were champions in first grade, reserve grade, junior grade and schoolboy champions in Under 14s, Under 12s and runners up in Under 10s. The matches were played at Trundle’s Berryman Park, and with Tullamore another grand finalist there was a strong Parkes shire flavour to the day. The newspaper was a special feature and not part of the microfilm collection in Parkes Library’s Family & Local History resources. Other copies of Peak Hill & District Times can be found on microfilm within Parkes Library and these cannot be found on Trove (although Trove has digitalised The Peak Hill Express 1902-1952). Roosters’ opponents Tullamore were considered the pre-match favourites but captain coach Jim Hando (also listed as R. Hando) lead his team well. Tries by M. Keed, R. Job, and K. Sharkey; with 2 goals by B. Keed and 1 by I Hando. Peak Hill defeated Tullamore 18 to 5. Peak Hill’s junior side were taking on Cargo, who took the lead with a penalty. 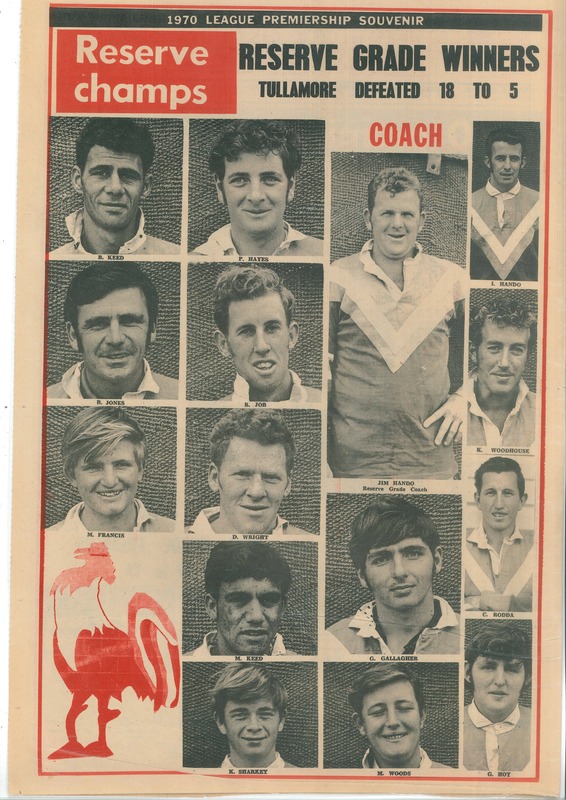 That two pointer was all Cargo could score, with the Junior Roosters displaying why Ron Hoy was considered one of the most gifted coaches in country rugby league. Tries by I. Rosser, N. Wagstaff, R. Wilson, P. Furner, R. Hoy and P. Hackett. B. Sharkey scored 7 goals with R. Wilson getting one goal. Peak Hill defeated Cargo 34 to 2. 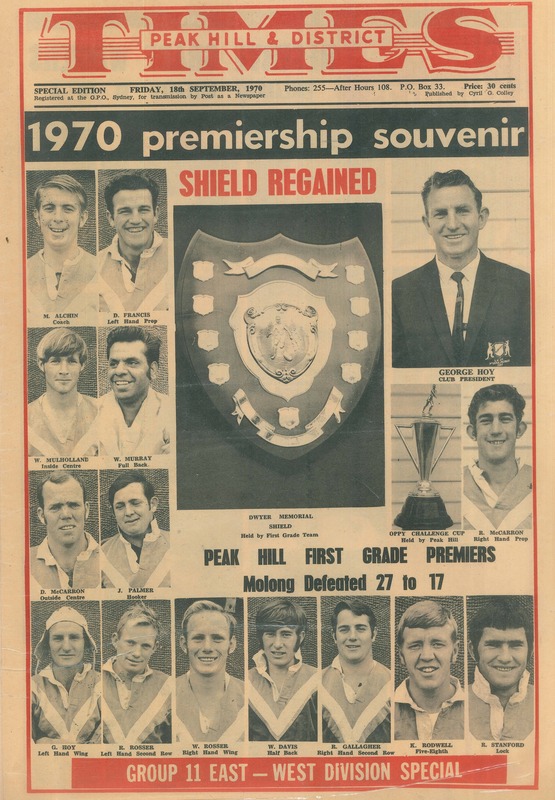 The 1970 National Fitness Schoolboy champions saw two more Peak Hill teams crowned premiers, and another one runners up. The Under 14s defeated Parkes High School 6 to 3. The Under 12s defeated Parkes Marist Bros 11 nil. The Under 10s narrowly lost to Parkes Marist Bros 3 nil. The special souvenir edition of Peak Hill & District Times is not available on microfilm. However during a clean up a hard copy, that had been laminated, was discovered and this is on display in the Family & Local History resource room. This room is used as the office for the Family & Local History Library Officer to research and publish the ParkesHistory blog, and conduct F&LH search enquiries. However it is also a room where members of the public can take advantage of the many resources. There are books on family history, local history and a small selection of general history books. The resources include microfilm of newspapers – such as Western Champion, Parkes Champion Post, Peak Hill & District Times and Narromine News. There is also an extensive collection of microfilm from the State Archives, thus saving Parkes Shire residents a trip to the Kingswood (near Penrith) head office. McCarron, J. (1970, September 9). Premiers 3 Grand Finals to Peak Hill. Peak Hill & District Times, pp. 1-8. 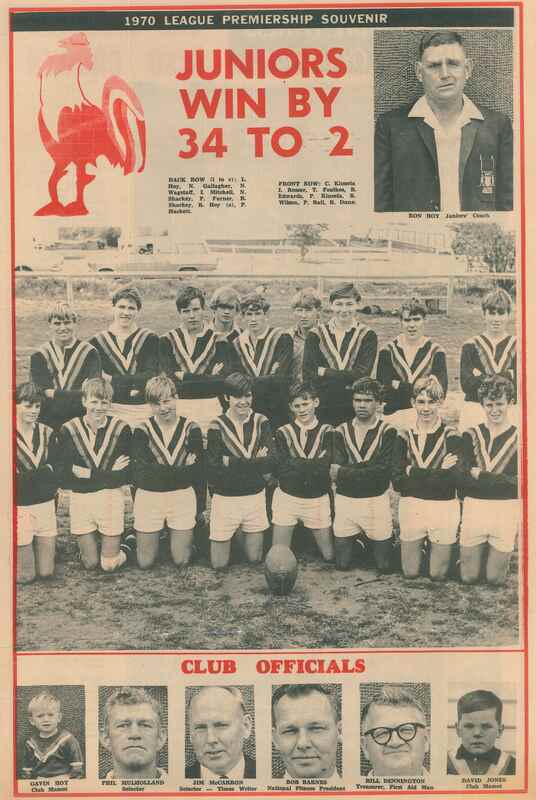 This entry was posted on February 17, 2017 by parkeslibrary in 1970s, Bill Lindner, General history, Lindner Oval, local historical articles, Parkes Library Family & Local History Resources, Peak Hill, Peak Hill Roosters, sporting fields, Trundle, Tullamore, Uncategorized and tagged 1970, 1970 National Fitness championships, B Keed, B Sharkey, Berryman Park, Bill Mulholland, Bob McCarron, Brett Finch, C Davis, Cargo, Charles Dwyer, Country Rugby League, CRL Group 11, Dan Fredericks, Darryl McCarron, David Jones, Dud Francis, Dwyer Memorial Shield, Family & Local History, first grade premiers, Gavin Hoy, George Hoy, Group 11 Rugby League, I Hando, I Rosser, J Palmer, Jim Hando, John Palmer, junior grade premiers, K Sharkey, Ken Rodwell, Library Officer, Lindner Oval, M Alchin, M Keed, microfilm, Mike Alchin, Molong, N Wagstaff, Narromine News, Oppy Challenge Cup, P Furner, P Hackett, Parkes Champion Post, Parkes High School, Parkes Library, Parkes Marist Bros, Parkes Shire, Parkes Shire Libraries, Parkes Shire Library, Peak Hill, Peak Hill defeats Parkes High School, Peak Hill Express, Peak Hill Juniors, Peak Hill Roosters, R Hando, R Hoy, R Job, R Wilson, Ray Stanford, Rex Rosser, Ron Gallagher, Ron Hoy, rooster, rugby league, schoolboys championships, schoolboys rugby league, second grade premiers, special souvenir, State Archives, Trundle, Tullamore, Wally Murray, Warren Davis, Wayne Rosser, Western Champion.